At last week's general audience, Pope Benedict received Msgr Walter Rossi, rector of Washington's Basilica of the National Shrine of the Immaculate Conception. The Shrine's spot in the baciamano -- the post-audience reception-line Benedict has heavily curtailed, thus making it even more coveted -- marked the highlight of its governing board's weeklong trip to the Eternal City. No good churchman climbs the Nervi steps empty-handed. So, true to form, Rossi presented the pontiff with an image of the statue of Our Lady of Altötting on display in an oratory of the Washington Shrine paid for by the German bishops and the Bavarian "national sanctuary" Papa Ratzi has frequently recalled making pilgrimages to on foot in his younger days. 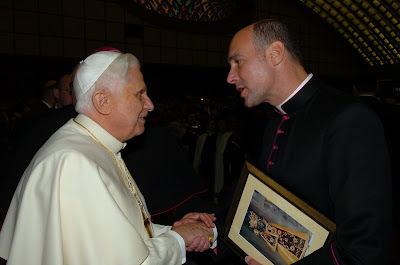 Such is Benedict's devotion to the "Madonna of Graces" that a copy of the patroness was his gift to Cardinal Angelo Sodano on his retirement as Secretary of State. But a day after receiving Rossi's gift, in his meeting with the priests of Rome, Benedict spoke of his three-day walking journeys to Altötting, where he returned last September during his homecoming trip. "Ever more," the Pope said to the Roman clergy, "we see that Shrines are a source of life and faith in the universal Church," calling his Altötting journeys "days of confession, of prayer, a true road toward the Madonna, toward the family of God and" -- only then -- "toward the Eucharist." A priest of the diocese of Scranton, the rector of the Western hemisphere's largest church said he was pleasantly surprised to find that the Holy Father not only knew well of his charge, but was keenly aware of its Altötting project. "You finally put this chapel in!" Benedict said, according to Rossi. When Rossi invited the Pope to "Mary's House," Pope Benedict -- who's spoken often of not knowing how much time is left to him -- said that "We'll see what God has in store." At the Shrine, work continues on the mosaic installation in the second of its three inner domes -- this one focusing on the Incarnation, sponsored by the Knights of Columbus and with a November target for completion. The project's final piece, taking the theme of the Holy Trinity, is expected to be completed in the Shrine's great dome in time for 2009's golden anniversary of the dedication of its Great Upper Church.